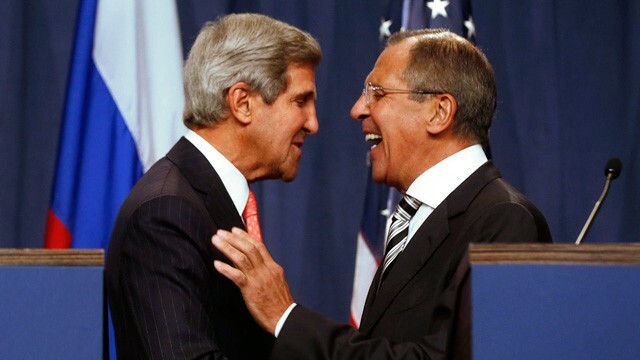 The news of the new framework for Syrian chemical disarmament, negotiated by US Secretary of State John Kerry and Russian Foreign Minister Sergei Lavrov, is being treated as a major diplomatic breakthrough. Ostensibly, the US was on the brink of striking Syria when an offhand comment by Kerry provided a path for cooler heads to prevail. I want to present a different side of the story: that it is far more likely to fail than succeed, that Bashar al-Assad is not likely to pay any price for its failure, and that it virtually ensures that Assad will remain in charge of Syria in the long run. First, there’s the timeline. Two weeks ago, the threat of US action was so imminent that elements on both sides of the conflict, as well as civilians, were scrambling to stockpile essentials and secure themselves. Now, the framework calls for disarmament to be complete by mid-2014. Under perfect conditions, this would be a rapid pace. Regardless, it means that the horizon is now considerably further away. For the next several months, the discourse will shift to whether Assad has been “given enough time” to complete his end of the deal. When nearly every aspect of the disarmament process is subject to security risks, how can anyone reasonably tell Assad that he isn’t moving fast enough? And he will ask for time. Many commentators have already noted that chemical disarmament is not an easy process under perfectly controlled conditions. Conditions in Syria, to put it mildly, are not controlled. International inspectors will need safe passage, secure residences, and goods and services to support them. The chemical weapons themselves must be accessed and possibly moved offsite for destruction, both of which are further security risks. All Assad must do is keep up the appearance of pursuing disarmament. When nearly every aspect of the disarmament process is subject to risks of this manner, how can anyone reasonably tell Assad that he isn’t moving fast enough? Now we come to the rebels. They have been entirely cut out of negotiations surrounding the framework agreement. This is no surprise — essentially their only common objective is the fall of the Assad regime. However, what role they are to play in the disarmament process is unclear. At best, they will not be an obstacle. This would require them to dramatically scale back their attacks against government sites, especially in the vicinity of chemical weapons facilities. Such a drawdown would gravely hinder their ability to confront government forces or even keep up the impression that they are contesting government control. The existence of a disarmament regime now provides logical cover for any anti-rebel operations the Assad regime will take. The rebels now are a security threat to Syria’s sincere and heartfelt effort to disarm. There are now two possible outcomes for the rebels. The first is defeat or neutralization. The second, in which they continue armed resistance, will lead to Assad intensifying operations against them, only this time with international backing. The international community will not allow this process to fail because of some shortsighted insurgents. Should the rebels be so insolent that they actually make headway against the regime, then the framework agreement will collapse. What role the rebels are to play in the disarmament process is unclear. At best, they will not be an obstacle. Salim Idris, the head of the rebel Supreme Military Council, sees this dilemma, saying that the initiative is a “waste of time” and that operations against the regime will continue. Although it is in rebel interests to see that Assad’s chemical weapons are destroyed, the process and its attendant requirements puts the rebels’ mission in grave danger. Thus, it is in their long-term interest to ensure to process will fail. If the framework agreement collapses, don’t think for a minute that the US will jump to punish Assad with a volley of Tomahawks. The barriers to a strike were formidable two weeks ago: low popular support, the loss of the United Kingdom as a coalition partner, and a majority in the House opposed to an authorization to use force. By mid-2014, they will only be higher. Accusing Assad of operating in bad faith will involve much hand-wringing, cost-benefit analyses, and staunch denials by the Russians. The American public, never one to stomach a protracted foreign affairs debate, will be uninterested in revisiting the issue. And the US midterm elections will be just a few months away, meaning Democrats will be risk-averse and Republicans will be strengthening their anti-Obama credentials. None of this is to say that the United States would have been better served following a more militarily confrontational route. Syria’s chemical weapons sites were always going to be a thorny international problem, especially if things had gone south for the regime. The framework agreement represents an effort by the US to wring some good out of an ugly conflict. But it’s important that we don’t lose sight of the trade-off that was just made: in exchange for rolling back the proliferation of chemical weapons, the US has sold out the Syrian rebellion.